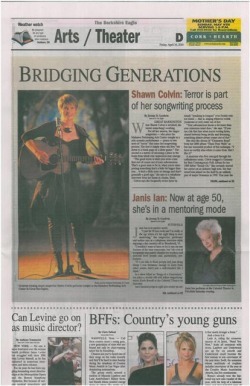 GREAT BARRINGTON—When Shawn Colvin is terrified, she knows something’s working. For all her success, the singer-songwriter—who plays the Mahaiwe Performing Arts Center tonight in a solo, acoustic performance—points to two sorts of “terror” that enter her songwriting process. The first is simply when she first “sits down to a blank page or a silent guitar.” The second is a matter of accessing a place in the brain from which true inspiration may emerge. “The good terror is when you write a line that sort of comes out of your subconscious. That’s a great state to be in, when you're interpreting something that's a little bit bigger than you… it feels a little scary or strange and that’s generally a good sign,” she says in a telephone interview from her home in Austin. Colvin says she frequently writes lyrics by simply “speaking in tongues” over freshly written music—that is, singing whatever words (nonsense or not) come out of her. “Your subconscious knows a lot more than your conscious mind does. If you can ride that line when you're writing lyrics, almost between being awake and dreaming, something almost always comes out of that,” she says. A musician who first emerged through the coffeehouse scene, Colvin snagged a Grammy for Best Contemporary Folk Album for her 1989 debut Steady On. She certainly started her career on an industry high note, but that award was joined on the shelf by an unlikely pair of major Grammy’s in 1998. That year she netted both Song of the Year and Record of the Year for “Sunny Came Home,” a bright, catchy song that appears to be about someone deciding to commit murder. “I snuck in and snuck back out again,” she says about her moment of mainstream ubiquity. Colvin says she doesn’t think a song like “Sunny Came Home” would sell a million records again in the current pop environment, but she’s unconcerned. A songwriter known for sharing a very personal perspective in her lyrics, Colvin is now writing a memoir for Harper Collins and finding the experience of writing about herself more harrowing than expected. It’s that willingness to bare her thoughts that have helped earn Colvin the loyalty of her fans.